Do you struggle to write the right phrases when giving performance appraisals? If so, you’re not alone. Naturally, the first step is you must correctly identify the strengths and weaknesses of your employees. You’ll accomplish this goal by avoiding 12 typical errors. However, in employee-performance reviews, many managers struggle in trying to think of the right phrasing that actually motivate employees. The reasons all stem from fear. Because of fear, the reasons range from worrying about an employee lawsuit to paralysis from analysis in not knowing how or what to write. Seldom do we talk about courage – a critical characteristic of effective managers. Employee appraisals are far more than just evaluations. When implemented well, they serve as opportunities for organization growth because they increase individual employee productivity. As every manager knows, a well-written set of performance goals work to motivate employees and help them to focus better on their responsibilities. But they must be written with the right phrasing so they inspire performance and don’t invite costly lawsuits in this 21st century litigious society. Careful planning is necessary before you give an employee an appraisal or in advance of terminating the person. You must say the right things in difficult situations with employees. 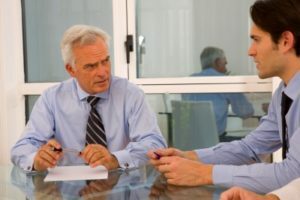 Courtesy of Business Management Daily, there are 10 recommended phrases for managers to use in performance reviews. They are from “2600 Phrases for Setting Effective Performance Goals” by HR executive Paul Falcone.